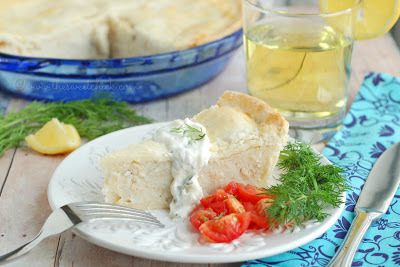 Grandmaman used to make this pie around Easter time, for those meatless Fridays during Lent. But this pie is great for any day of the week. It's easy to make and it tastes great. You can boil your potatoes on the stove-top, but I actually boil mine in the microwave with my Pampered Chef Rice Cooker. Only 10 minutes and they are fork tender. You want the mashed potatoes to be moist, but not watery. You don't want a soggy pie crust. I did end up adding a light egg wash over the crust before putting it in the oven to to get it to have a golden glow. Typically in Quebec, they just slap on some ketchup and call it a meal. And I am ok with that. That is how I grew up eating it. But, this time I wanted to fancy it up a bit, so I made a a creamy lemon dill sauce to accompany it. Since Chobani was kind enough to send me some of their tasty Greek style yogurts to sample, I wanted to incorporate them into the sauce. If you haven't tried their yogurt yet, I highly recommend you try it. And no they didn't pay me to say that. I have been eating their yogurt for a while now and like it better than the Yoplait I used to eat. It does have a slightly sour aftertaste, but the the texture is smoother and the flavored ones don't have that overly sweet taste that the other yogurts have. I have used it in smoothies and some of my desserts with great results. Even my little ones like Chobani. I was really pleased at how creamy this sauce came out. I think it would make a great veggie dip also. I just put it on my slice of pie cold, but you can warm it up a little in the microwave if you like. You can serve this up with a side of veggies, or a salad. Either way, it makes for a delicious meal. And for those of you that are curious, yes my grandmaman is still alive and very healthy. She just happens to live in an assisted living type facility and does not have a kitchen in her small apartment, so she doesn't cook anymore. I miss her pies. Peel and cut potatoes into halves, place in a medium pot and cover with water. Bring water up to a boil over medium high heat on stove top and boil for 10-15 minutes or until potatoes are fork tender. Drain potatoes and place in a large bowl. Mash potatoes until no longer lumpy. Add in the salmon and mix until all incorporated. In a 9 1/2 inch pie plate, place the first pie crust at the bottom and fill with the potato/salmon mixture. Next, place the second pie crust over the mixture. 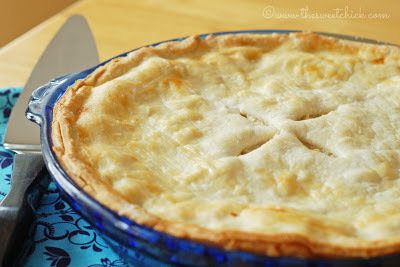 With your hands or a fork, go around the entire pie and press the two pie crusts together at the edges to seal. Cut off any excess crust with a knife. Cut 3 or 4 small slits in the top crust to vent. In a small bowl whisk the egg and with a pastry brush, brush a thin layer over the top pie crust. Place pie in the oven and bake for 15-20 minutes or until the crust is a golden color and flaky. Place all ingredients in a medium bowl and mix until well blended, then serve with the pie. If you want you can warm up the sauce in the microwave for 15-20 seconds or until desired temperature is achieved. This sounds amazing and easy! can't wait to try it.